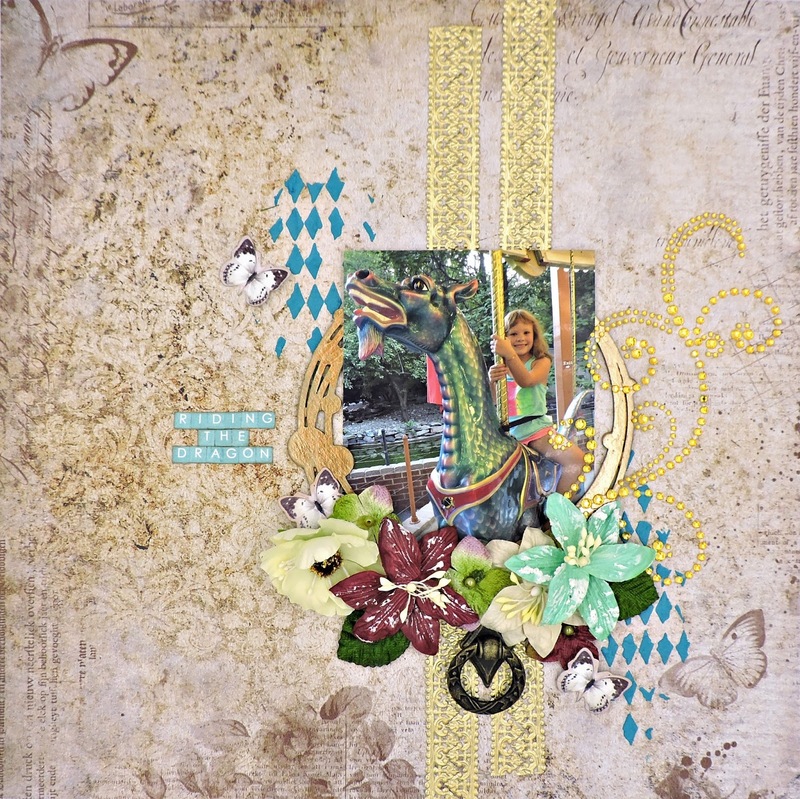 This is my last layout using the August Tranquility kit from Swirlydoos, featuring gorgeous papers and flowers from Blue Fern Studios' Tranquility collection. I was trying to think of a way to use all of the beautiful golden items that came in the Embellishment add-on kit when my DIL sent me a series of photos and gave me a total "ahah" moment! I blended the Ranger Distress Grit Paste from the Mediums add-on with Prima Mica Powder in Teal and Metallique Paint in Emerald Green until I got the color I wanted to use with a long-neglected Dylusions stencil. While that was drying, I coated a chipboard frame (thanks, Rae!) with Ranger Liquid Pearls in Brass. Several strips of Prima Dresden Trim were adhered to the paper, then I glued the frame and photo down. I used just about the last of my flowers, a few butterflies from the Magnolia Lane ephemera, the bling swirly and that awesome metal pull. The Norristown PA Zoo holds an annual picnic for member families. Sophia enjoyed the food and the animals, but most of all, she loved riding the carousel with this amazing dragon. This looks great, Peggy! I love the turquoise diamonds and your mix of colors! I always scrap so matchy matchy and then I'm not pleased with the results, and I look at all your gorgeous mix of colors and I love it!